I had the thought of starting this essay on the present disorder in Nigeria over the removal of the ‘subsidy’ on petroleum price with an Adam Smith’s Wealth of Nations quote that holds all forms of subsidy in an economy as disadvantageous to the economy. However, subsidy is not what occurs in the Nigerian petroleum sector as claimed by the government. A former Minister of Petroleum Resources, Prof. Tam David-West debunked the subsidy claim as fiction and in calculations corroborating Prof. David-West, a former Head of the Department of Petroleum Engineering at the University of Ibadan, Dr. Izielen Agbon, found that despite the non-efficiency of Nigeria’s four refineries, their grimly sabotaged low capacity can still meet about 80% of daily domestic needs and the price of a litre of petrol ought to be N40. What has been occurring is that the Nigerian government has been paying for the huge cost of its inefficiency while having Nigerians surcharged for petrol prices. Petroleum marketers have been the beneficiaries of the government’s inefficiency payments. 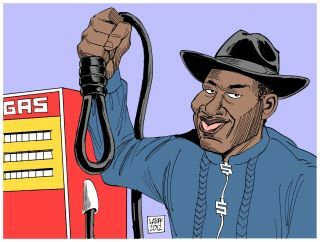 However, when it seemed that the government was ready to end the magnanimous corruption in the petroleum industry, it did the unthinkable. It poured the costs of its inefficiency on the country. First, it said that if it does not stop the expensive business of paying part of petroleum prices for the citizenry it will jump into the abyss of bankruptcy whose brink it was already at. Second, it published the names of the petroleum marketers that had been taking advantage of its payments, supposedly to direct the anger of Nigerians at them. Then it arbitrarily handed over Nigerians to the mercy of the coffer-bleeding marketers on the first afternoon of 2012. The announcement was dropped like a meteor and it razed the New Year celebrations in the country forcing out the anger Nigerians have had about the weakness of the government to deal with corruption that continues to hamper the country’s development. The government could not show its strength on the petroleum marketers. It could not take the rational steps of getting the local refineries effective and opening of Nigerian gates to foreign investors that will be build refineries. Those steps would have automatically stopped its payments to petroleum marketers that get paid for importing refined oil into the country. Rather, it gave helpless Nigerians up to the powerful petroleum marketers its vested powers had been unable to deal with and subjected petrol prices to their discretions. Since the soaring of petrol prices from N65/litre to the official N141/litre, fuel has been obtained up to N200 in some parts of the country. The government, having illusorily passed its inefficiencies to the citizenry and thinking itself free of them, has been vigorous about its feeble reasons for the reckless policy: how the funds it ought to be paying to the petroleum marketers will be going into capital projects as outlined in its hastily assembled, Subsidy Reinvestment and Empowerment Program, SURE, program whose goals smacks of unfeasibility like past failed capital projects of Nigerian governments and how other African countries are paying higher petroleum prices among other untenable reasons. Its dubious moves started being checked by similarly vigorous protests since the day it announced the end of cheaper fuel. And from today Monday, 9th of January, organized labour movements, the Nigerian Labour Congress, NLC, and the Trade Union Congress, TUC, will be shutting down the country literally like a computer while what has been tagged the ‘mother of all protests’ across the nation. The demand of the labour movements that adequately represent the yearnings of the majority of Nigerians is for petrol prices to be reverted to N65. Government can then choose to either take rational steps about its inefficiency or continue to bear its costs. In a bid to check the labour moves the government got an injunction from the National Industrial Court that labour should not embark on all its plans last week. The labour movements rejected the injunction and would continue with its protests. To also placate Nigerians’ anger, the government launched a Mass Transit program with 1600 buses yesterday. The buses were the palliatives to cushion the effects of the policy, as if only bus fares and not the prices of all other goods in the market have risen. How the buses are to be distributed across the nation is also a thing of interest. Nigeria has about 160 million citizens and how incredible of the government to hold the 1600 buses adequate for the population. The SURE program of the Nigerian government makes it plausible that the Nigerian government is kilometres away from the brink of bankruptcy. A government that is going bankrupt will not plan on embarking on massive construction of capital projects after successfully cutting costs in an area of its economy. It will rather save the funds it is able to cut and re-invest it in self-sustaining and profit-earning ventures. Capital projects are hardly self-sustaining and they hardly earn profits. Even if tolls are earnable on roads constructed under SURE, the institutional corruption the government was quite helpless about in the petroleum sector will disallow it from earning such. A new fearful group of toll collectors would have emerged to render government ineffective. And to address another nauseating reason the government’s economists give; that Nigerians should pay higher fuel prices because those are what are obtainable in African countries of Niger, Benin, South Africa and Ghana, what Murray Rothbard, an economist of the Austrian school, wrote in Making Economic Sense, about similar arguments in the United States in 1993 that since Western Europe has more than double of the United States retail petrol prices higher petrol taxes are imperative will be used. He wrote “Maybe we can find lots of countries with a higher TB rate. Are we supposed to rush to emulate them too?” President Clinton did increase gas taxes though. Nigeria is incomparable to the cited countries, especially South Africa and Ghana whose working infrastructure and relatively higher standard of living allow the finances of their citizenry to afford high petroleum prices. Living in Nigeria is thriving against rusted infrastructure. Were the Nigerian government moral, it would avoid a policy that will break the adaptation capacities of Nigerians to the unfavourable and largely improvable bad living conditions. It would rather seek to reduce the salaries of its political office holders that gulp over 25% of the budget annually and use the cuts to fund the rational steps needed to redeem the petroleum industry. Yemi Soneye is a writer and poet based in Osogbo, Nigeria.